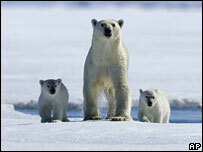 Two-thirds of the world's polar bears will be gone by the middle of the century, says a US government agency. The US Geological Survey (USGS) says parts of the Arctic are losing summer ice so fast that no bears will be able to live there within several decades. Scientists believe Arctic ice will hit a record low this year. The US government commissioned the study to assess whether polar bears should be protected under the national Endangered Species Act. Its decision is due in January 2008. The species (Ursus maritimus) is classified as Vulnerable to extinction on the internationally acknowledged Red List of Threatened Species. 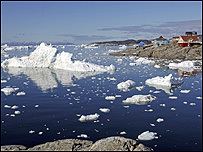 The USGS surveyed evidence on the decline of Arctic summer ice, which has accelerated in the last decade, and the projections of climate models. Based on this, they concluded that some areas where polar bears now roam, such as the Barents Sea north of Norway and Russia, would be unable to support the animals at all by the middle of the century. The bears might persist in other regions; but about 40% of the summer habitat will be gone by 2050, and with it, two-thirds of the current population, the USGS concludes. Last month, scientists at the US National Snow and Ice Data Center said Arctic summer ice was almost 30% below the long-term average, and predicted 2007 would show the lowest ice cover on record. Polar bears use ice as a hunting base. "The grim news about polar bears and sea ice decline is horrifying, but it is a call to action, not despair," said Kassie Siegel of the Center for Biological Diversity. "Our hope lies in a rapid response, including both deep and immediate carbon dioxide reductions and a full-court press on other greenhouse pollutants." The Center has petitioned the US to list the polar bear as an endangered species, which would oblige the government to protect it. Campaigners believe this would mean curbing greenhouse gas emissions. As the USGS report came out, the US administration was negotiating the "Sydney Declaration", a document on climate change, at the Asia-Pacific Economic Co-operation forum in Australia. The deal aims to reduce the rate of growth of greenhouse gas emissions on a voluntary basis.